​There is a risk that confabulation will rapidly embellish the memory of a string of weary hours trudging through the bush, no matter how scenic regular tourists might regard the vista. If I get this out now, within a week, it should partially resemble the truth. Enthusiastic Flyers curious about stepping up might find a hint of encouragement. Those contemplating retirement from ultras will find comfort too. The indefensible middle ground making a habit of this kind of thing are best left to their own delusions. ​I’ve never run a serious race “with” someone else. 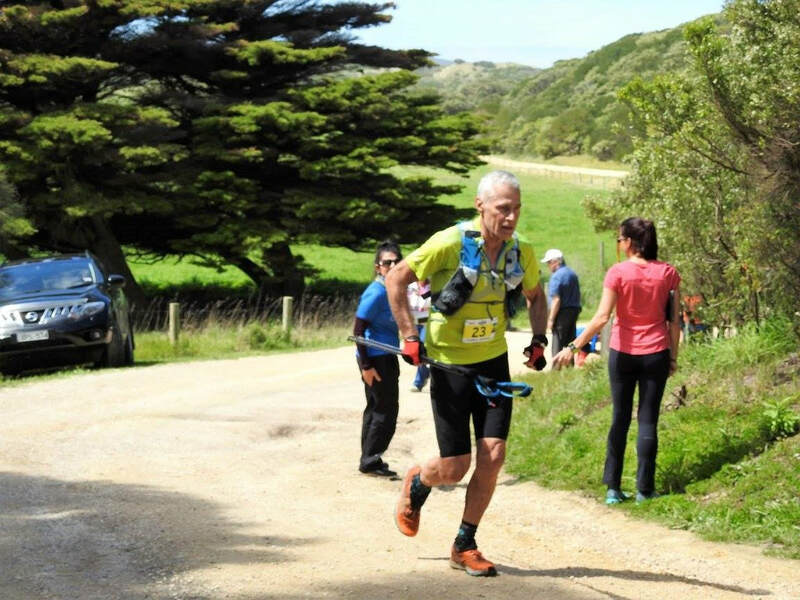 But 12 months ago, after 2016 GOW100s, on the bus from the finish at Twelve Apostles back to Apollo Bay, a plan was hatched to run 2017 with a guy I’d just met. Not entirely altruistic, as I highly rated Mic’s determination to achieve his goal of sub-13 hrs, which gets you a silver, rather than a bronze buckle. That’s colour, not metallurgical composition. Both have a face value of about $5; their actual value would be $1000s depending on your charge out rate and how many hours you trained. Mic had just missed out on sub-13 hrs by 35 minutes, but I’d dipped under in 12:55 hr. People remarked on this fortuitous result, but I knew it was consistent with my pattern of underachievement, doing just enough to meet arbitrary benchmarks, joining my 2:54 hr marathon and 9:59 hr Ironman. We spent the next 12 months on the sub-13 hr project, covering every conceivable aspect of gear, training, diet, and mental strength. I’d jettisoned 2 kg of dead weight from Mic’s vest, figuring that alone would be enough. Mic’s Strava data were impressive, with repeated weekly cycles of 100 km, 160 km, 180 km, peaking at 200 km. In contrast, I could manage only half of his volume, getting more serious 3 months out. But compared to last year’s training, I ran a lot more and, now being a Flyer, significantly faster and more racing. 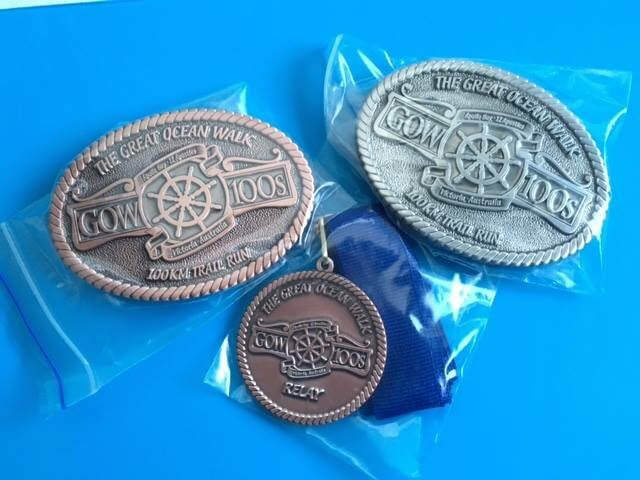 For me, 2017 GOW100s was to be a training run for GSER100 (100 miler, with 10,000 m vertical) on 17 November. I didn’t care so much about sub-13 hr. I mainly wanted to get Mic there, and experiment with an all-day effort carrying and using poles, and relying on homemade nutrition. Three weeks before I was all good, then a worrying knee pain set it. Mic on the other hand was meticulously prepared for this single event. In trail racing, pacing is a critical, yet formidable, challenge. My standard approach is to go out fairly hard in the cooler air when I feel fresh and can eat and drink, then slow down a bit in the second half, being motivated not to lose my hard-earned banked time. Mic had a theory that a negative split, or at worst, even split, was the best way. If you are thinking these cross-purposes portend potential disaster, then you’d be right. Through the year, we’d mocked a few high profile race results with 1st and 2nd placegetters corrupting the concept of a race by finishing in the same time, so there’d be no hand-holding at the finish line for us. The basic plan was for Mic to stay ahead of me. He’s a better descender, but I don’t stop much. We managed two runs together even though Mic lived in Geelong, and then moved to Brisbane. They went alright. There was plenty of time to talk tactics, as we met at Tullamarine and drove down to Apollo Bay together. I could fill an entire story with entertaining anecdotes about the backpacker hostel, but suffice to say it was basic accommodation – a hot shower would have been nice. The race changed a bit this year, starting an hour earlier (in the dark), adding another sand beach section, and having to carry all the mandatory gear from the start. 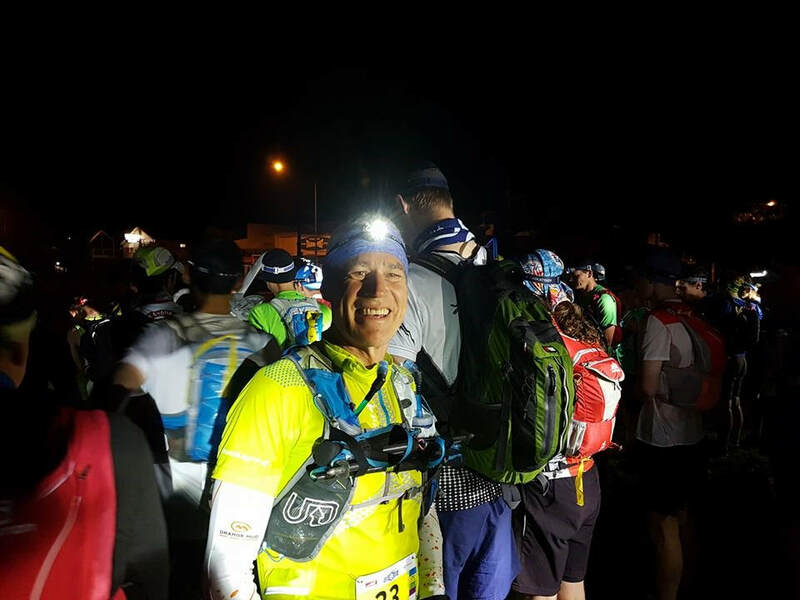 In the interest of weight savings, we’d sought permission from the race director to use Petz e-lite head torches (you need 2 torches). Their tiny weight of 26 grams comes at the cost of only 50 lumen and an unfocused beam. We didn’t anticipate needing it for long, and intended to freeload on other people’s more powerful beams. That was a miscalculation. I spent the first hour running blind in my own shadow, cast by the lights behind me, my light doing nothing to infill the blackness. Inadvertently switching it to the 16 lumen position didn’t help. Protracted rain preceding the race meant that the first 20 km was run in pretty much continuous mud. On the climbs the mud sucked on my shoes and threatened to pull them off, and the mad descents tested my nerves. So far, Mic and I were never more than 20 metres apart, running together into CP1 at 22 km. I’d let Mic set the pace. It was slower than last year, but 7:20 min/km average was good considering the mud and the hill we’d just climbed; if we kept it up we’d do a 12:13 hr and be just outside the top-ten (I knew the likelihood of that was zero). No support crew this year, so we just refuelled. Mic was quick, and champing at the bit ready to leave. I had a sudden thought to take off my arm warmers, and turned back a few steps. Mic looked displeased. Ten seconds later I turned to go, and he’d vanished. I took off after him, as he couldn’t be more than 50 m away. The track winds through forest, so I couldn’t see very far ahead. How fast must he must be running? I’d ramped it up, passing a lot of runners and getting my average down to 7:00 min/km. After a ridiculous 20 km of this caper, I pulled into CP2, burned. Surprisingly, Mic wasn’t there. At that point I decided I’d be running another 10 km, then walking the second 50 km. What a debacle. The truth was, I couldn’t run anymore. In 2001 I was struck down with knee problems that caused my sudden retirement from sport. The positive side was plenty of time to spend on romance and travel, a potent combination that soon resulted in a wedding. Ask Leny about the honeymoon I surprised her with – luxury room with views of Lake Macquarie, every modern convenience, personal assistants on call 24 hrs a day, room service breakfast lunch and dinner, plus morning and afternoon tea…at Warners Bay Private Hospital. I’m still not forgiven. I had a series of operations on both knees – autologous chondrocyte implantation to repair cartilage impact injury defects and osteotomy to realign my patella. Couldn't do sport for 12 years after that. Lucky to be running now I suppose. Actually, I’ve got to thank Maya for that. I tried many comebacks, but they all ended in tears (both homonymic meanings), until my little daughter really wanted someone to run with her around Stockton to prepare for school cross-country. All roads lead to Flyers. 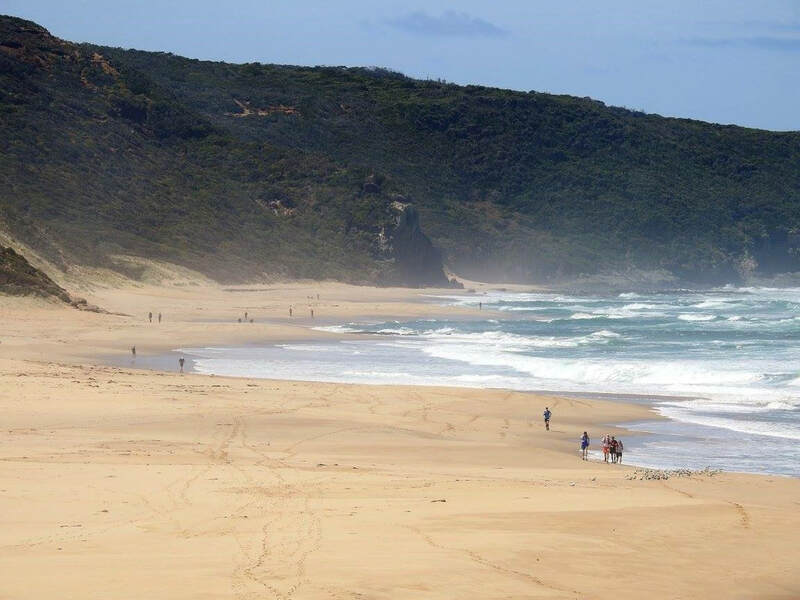 By the time I got to CP3 at 55 km I was already committed to walking it in, although out of Stocktonian pride I ran the length of Johanna Beach, while everyone around me walked. There is not much to say about the next stage of the race. My sticky rice-based food was going and staying down, my pole-running was better than I anticipated, and my walking pace was solid. The moment I tried to run though, I experienced severe pains emanating from my knees, shooting into my quads, causing complete loss of power. I had plenty of time to think of reasons to pull out while trudging towards CP4, at 80 km. Known as “The Gables”, it’s a miserable exposed location, notorious for destroying the will of even the most determined stragglers. After several hours, my list of reasons to drop was pretty long, then I started working on a list of reasons not to drop. I figured I only needed one, and sure enough, it materialised. In the ultra-trail world, most races of 100 km or longer need qualifiers. The directors don’t care how long you take, as long as it’s inside the cutoff. Some races might need two 100 km finishes in 12 months. So, races like GOW100s are populated by proven performers – it is hard to crack top 10 here, and there are very few DNFs. That brings me to my second reason not to drop – I had a clean sheet to maintain – I’ve never DNF’d in my life. I got to about 70 km, still toying with the idea of dropping, when I came across a runner who could barely stand. She forgot to get water at CP3 and was in a bad way with dehydration. She didn’t even notice she was unnecessarily baking in her high-vis vest. I took it off and put it away for her. Then I offered her half my remaining water (about 300 mL), which in truth was carefully managed to be just enough for me. Most people would initially reject the offer out of politeness and concern, but not in this case. She grabbed it and skolled it without a thought. Incredibly, it revived her, and within minutes she was running. I ran with her to CP4, pretty slowly, but it demonstrated that running in pain was technically possible. At CP4 the volunteers cheered me up, fed me and hydrated me, and I changed my shoes and socks. ​Sitting in a chair at The Gables, my thoughts turned to Mic, probably nearing the finish line for a glorious 12:00 or 12:30 hr time. Then I overheard his name uttered in hushed tones in a conversation between two officials who happened to be standing behind me. Two runners in the race were “in trouble” and struggling to make progress, and Mic was apparently one of them. I was thinking, he must be really close to finishing, so he’ll be alright. I asked them where he was and got a shock to find out he was way behind me. Later on, I managed to raise him on the phone. Apparently, he didn’t leave CP1 before me. He too decided to take off his arm warmers. In doing so, he moved slightly and bent down, which is why I didn’t see him when I stood up. But nor did he see me depart. So when he left, he reduced his speed to let me catch up, while I was running faster mistakenly trying to catch him. We just got further and further apart. ​Mic was definitely intending to drop when he reached The Gables. He was devastated. 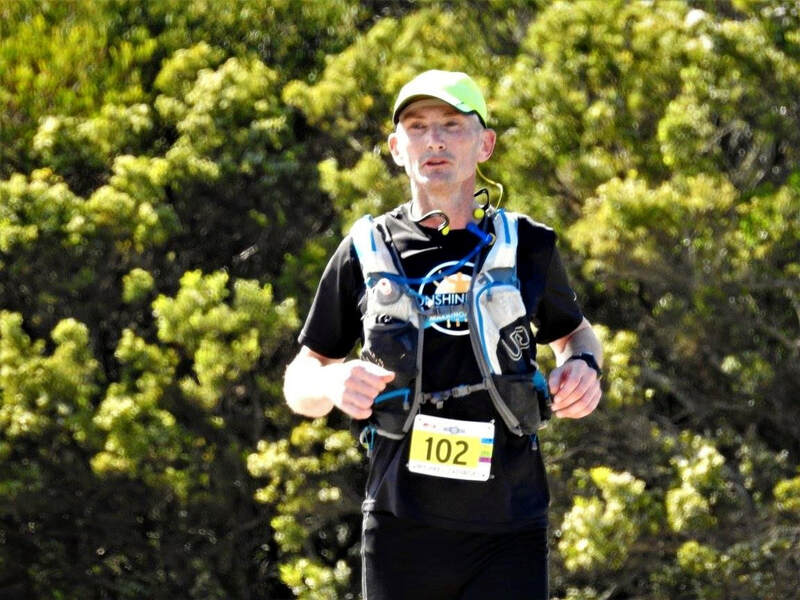 Bad gastro-intestinal issues prevented him keeping anything down from CP1 onwards. I told him to let the volunteers try and revive him, and I’d even go back there and wait for him. But he was adamant that I should press on, which I did, feeling a bit sheepish. The last 20 km to the Twelve Apostles was not what I’d call all that physically difficult, more tedious. The sun was going down, and with a sense of resign I pulled out my puny Petzl e-lite. The path is narrow, varied, and dark, with a lot of obstacles. I couldn’t see a thing. The partial moon was casting more light than my torch. Lucky I’d been there once before or this would have been a seriously difficult challenge. Press on. I had the occasional companion for short periods, and I’ve become used to my incidental fellow runners being people you could imagine becoming your best mate. Occasionally the interaction is a little different. Going way back to the first few kilometres of the race, a bloke running beside me quizzed me about my age. No disrespect, but in the dark he looked pretty ancient. He informed me he was 63 yro, and was proud to have pipped me by 3 years, and then promptly ran off ahead of me. Pretty strong effort, but it was early days. In the last few kilometres of the race, still thick in the bush, barely able to see where I was going, some runners behind me got a sniff of the finish and started to jog it in. I didn’t mind at all; I was semi-acquainted with most of them. Now I’d reached the Visitor’s Centre, about 300 m to go. I rounded a building where a marshal was stationed to direct us around the perimeter of the carpark, marked by cones. It’s a condition of having the finish set up there. Some runners could be tempted to make an incorrect B-line for the finish arch through the carpark, or run on the road proper. Behind me I could hear the marshal yelling at a runner to go the right way and advising him to follow me. I decided to pause and wait up, to help direct him. ​Is there a passing etiquette at the finish of a 100 km trail race? I imagined that at this stage, we’d just stay in the established order. But I was in for a surprise – he was no hand-holder. It turned out to be the ancient 63 yro bloke (I must have passed him in a CP). Upon seeing me, he took off along the shortest line up the inside of the road, short-cutting the cones. With 150 m remaining, I wryly asked if he was going for a sprint finish and he said he was and I could too if I was up to it. Most unexpectedly I was in an ignominious situation. I could have raced it in, running poles impart a certain invincibility. But what kind of spectacle would that have been? Two old codgers hobbling along in the dark in a desperate fight to the finish. Quick, get the guerneys and oxy-viva out. No, I couldn’t show my face here again if I got involved in that business. So, I accepted that he wanted it more than me, and didn’t even raise a jog. Ignominy turned to magnanimity. I’ve officially gone soft. Well done Bill. I felt as normal as one possibly could, having just covered 100 km. The finish area is a highlight. An awful lot of joking around while warming ourselves on the gas heaters and getting stuck into the great selection of food. Someone even brought a box of beers. I reconciled with my nemesis by celebrating when he reported that his watch revealed he’d just achieved his second highest ever number of steps in a day :-) (this is clearly still bugging me). I messaged Mic to see if I should get a lift into town to meet him at the accommodation, or was he still in the race? No reply. Some time later I got a surprising message from Mic’s wife to say she was monitoring his progress via his SPOT tracker, and he was only 4 km from the finish. Mic came into view, running through the timing arch to the accompaniment of an orchestra of cow bells. After our last 12 months of preparation, celebrating Mic’s finish was a special moment for both of us. He didn’t harbour any hard feelings, but was adamant though, no more attempts at sub-13 hr here. ​Sunday passed, and Monday night we flew home. Mic was still adamant. Tuesday I got a message from him, one word, “Redemption”. Seems we have an appointment in Apollo Bay next October.